He was praying specifically for His followers of that time, especially the apostles. This is one of those verses (among many) from which much insight is gained through the simple practice of emphasizing one word each time you say it. If you are able to do that, and stop with each new sentence to meditate on the emphasized word, you will have more than fulfilled your “devotional requirement;” you will also have increased in understanding of a part of God’s word. Hopefully, the rest of this article will help you in that quest. Most people are fairly sure it has something to do with being holy, and that would correct. But, that leaves us with the question, “What does ‘holy’ mean?” We all know that “holy” is a religious term. It doesn’t have anything to do with business or with buying groceries or anything else outside of church. Yes, it does. It has a lot to do with every aspect of our lives. 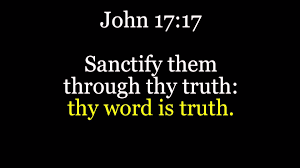 Our English word “sanctify” means to set apart or declare holy; to consecrate. The word that is translated such is ἁγιάζω (hagiázō, hag-ee-ad'-zo), the verb form of the word “holy” which is ἅγιος (hágios, hag'-ee-os). The entire word group—sanctify, sanctification, holy, holiness, saints—comes from this word. Holiness, then, is to be separated from the world and to God. Growing up Catholic, I was presented with the example of the priests and nuns, who had left ordinary life, wore religious attire, and dedicated themselves to God. I later discovered that this was not the full meaning nor application of being holy. This is where it gets a little bit tricky to understand God’s intents and purposes for and with us. Notice that the verse quoted above is about God’s effort to sanctify us. The word “sanctify” is only used six times in the NT. Four of those times it is about God doing something to us. In other words, we are sort of passive in the situation, allowing it to happen to us. With just this little bit of information, it would be easy to conclude that there is nothing required of us in the idea of sanctification. That is a drastic, but all-too-common mistake. The word for “follow” is also the word most often translated “persecute.” So, holiness is something that we are to pursue hard after. It is to be one of our goals, if you will. Therefore, we ought to concern ourselves with holiness in our individual lives.